Surely not the usual dark gemstone men's ring, the MAN122 men's spessartite garnet ring symbolizes the modern man. A sparkling 9x7mm oval spessartite garnet gem adorns the center of this handsome ring. A rare variety of garnet, spessartite is sometimes referred to as spessartine. Available in a color spectrum that ranges from orange to a more saturated reddish orange, this gemstone has had its share of ins and outs in terms of availability. Namibia was the first source for spessartite, the gem soon became a sensation and this resulted in a rapid increase in price. And then all of a sudden there was no spessartite in the markets, the Nambian spessartite was awesome but was not really abundant.A few years later another group of African nations claimed to have found spessartite deposits in their country, Tanzania, Madagascar and Nigeria started to supply moderate to good quality spessartite garnet gems. Experts are fine with the visible inclusions and fissures in these spessartine gems as they realize that, it is the way nature made them. Our recommendation would be to go for a slightly saturated gem color in your spessartite men's ring. The color shown in the MAN122 ring is fine as, it reveals the color and sparkle of the gem and removes the focus from the internal inclusions. A slight dash of red to the orange is welcome but, a strong red hue makes you feel that you would be better off with a red garnet gem! Kaisilver takes great pride in introducing fascinating jewels to style conscious buyers, this gold or 925 silver men's spessartite garnet ring has been crafted with excellent workmanship and custom cut gems. Beginning with a design that is inspired by durability and style and on to, the carefully picked rough piece of spessartite that is immaculately custom cut, skilled artisans create each ring with complete dedication and passion. Most us are used too seeing or wearing men's gemstone rings with gems that are dark and often opaque - blue lapis, agate, onyx, dark blue sapphire, deep red garnet, smoky quartz etc are examples. It is therefore expected that the MAN122 men's spessartite garnet ring will draw a lot of attention but, for the knowledgeable eye the gemstone holds excitement and awe since, it is truly rare and stunning. A quick note about spessartine (spessartite) being worn as the birthstone for January. In the early days when the concept of zodiac based and month based birthstones took shape, no one really expected to find garnets in any color but red. You therefore find red garnet as the most popular garnet to celebrate the month of January. In our opinion, increased knowledge and scientific testing can now be relied upon - all varieties of garnet should come within the scope of January birthstones. The diamonds around the center oval spessartite gemstone add glitter but, some of you might wonder whether the sparkling spessartite needs their presence at all. Just keep in mind that like all other Kai Silver jewelry, this spessartite gents ring is also fully custom made, you can request for design and gem modifications of your choice. You could for example, request that your men's gold or sterling silver ring be set with white sapphires instead of diamonds. Many true gem lovers adore natural gems of all types and colors but, are not particularly fond of diamonds. 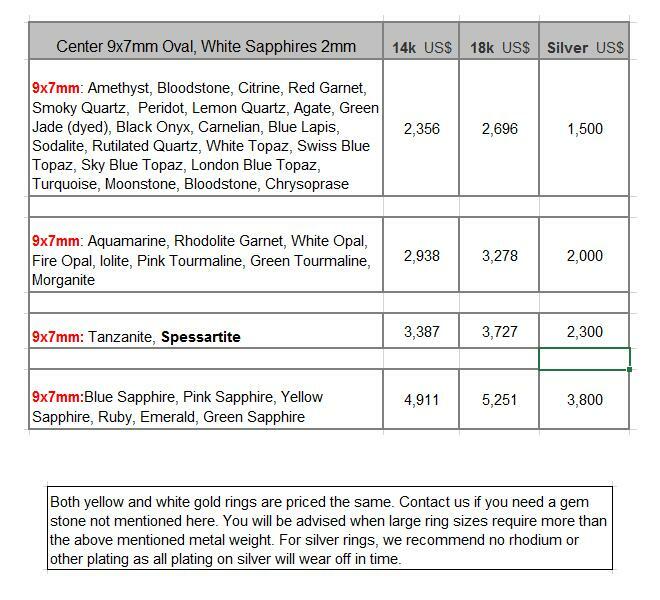 Switching white sapphires for the diamonds in your spessartine garnet ring, will also moderate the price tag of the jewel - the price tables presented below will give you a clearer indication of costs. Another interesting variation would be to request for a gem size increase to 10x8mm instead of the 9x7mm option, leave out the diamonds and the price difference would not be very much. These are details that we suggest you discuss with our support team, there is no obligation to make a purchase from us so do make sure that you explore all your preferences and ideas. The same standards of workmanship and gem quality are maintained for gold and 925 silver rings. The 14k or 18k white, yellow or rose gold men's spessartite ring has a weight of around 20-25 grams. Request for a price quote if you prefer 10k gold, all three gold colors are available. The sterling silver spessartite gents ring has a weight of around 15-20 grams. Plating is not recommended for the silver men's ring as no plating lasts forever. We can however provide white rhodium, yellow gold or pink gold plating for the 925 silver ring. Each ring is custom made in all ring sizes, very large sizes might require more metal weight. The center gemstone is a 9x7mm oval, a price quote for a 10x8mm oval gem can be requested. Spessartite used by Kaisilver is natural and untreated, thoroughly checked by our experts. Since garnet is the birthstone for January, spessartite garnet could be an option. You can choose the gemstone of your size for your gents silver or gold ring. The diamonds are 2mm rounds, G-H and SI1- SI2 quality - approximately 17 pieces in all. The diamonds can be replaced with 2mm round white sapphires, check price tables for details. All design modifications can be accommodated, since every spessartite ring is fully custom made. The portion behind the finger is around 6-7mm, this makes the ring sturdy and long lasting. Specific requests for no scooping inside the band might incur, additional metal weight. Kaisilver: Widely acknowledged as the leading online source for high end custom made jewelry, we craft both gold and silver jewerly with high quality standards. Designs can be picked from our exclusive collection or provided by you. By scouting the best talent and expertise for craftsmen and artisans in Thailand, we work with some of the most passionate jewelry creators in Asia. A leading edge mastery over gem sourcing and cutting, has put us into direct contact with gem mines across the globe. Gem cutting houses offer us preferential access to more than 200 million carats of cut and polished gems. This is what allows us to get the best gems at every price point, we do not restrict your gem selection to what we have in inventory or what is shown on our website. We encourage you to discuss all your gem and jewelry needs and queries with our experts at sales@kaisilver.com. You will never be pushed to making a purchase so, there is no reason why you should not take full advantage of our thorough knowledge and expertise on all issues related to gemstones and jewellery. 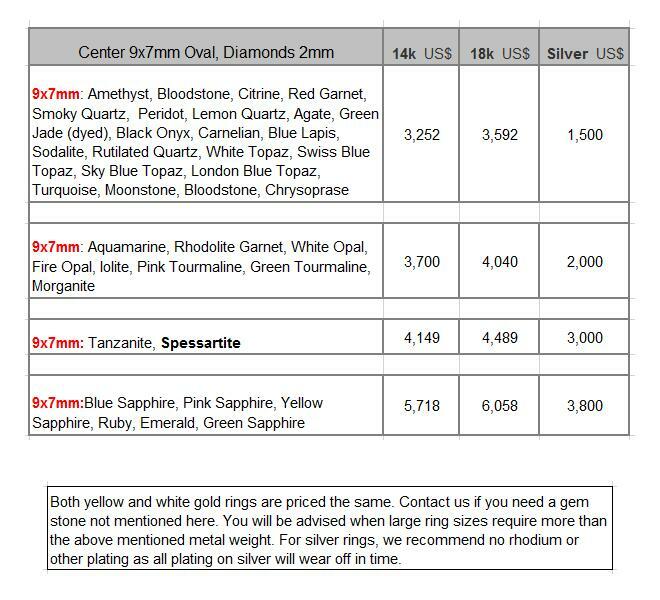 Buying: To begin with we do not provide or encourage the 'quick buy' option for our jewelry, that is just not the right way to buy or sell high end jewelry. You can email your own designs to us at sales@kaisilver.com or pick one from our website and request for modifications (if you desire). All jewelry can be custom made in gold or sterling silver, you can choose 14k or 18k gold in white, yellow or pink color. We can custom make 10k jewelry on request, ask us for a price quote if that is what you wish. There is no limitation on gem type, shape, size or cut so you do not need to limit your selection to what is mentioned on our websites. Production is around 4 to 6 weeks from the date of order confirmation and receipt of payment. We accept payment through Paypal and Western Union but, do not recommend Western Union for first time buyers. You can let us know which mode of payment is best for you and we will provide details for the same. Shipping will be through FEDEX with web tracking and you will be provided with the tracking number the moment the parcel ships. Related Resources: Spessartite Gems Report.